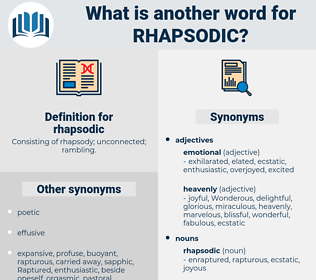 What is another word for rhapsodic? 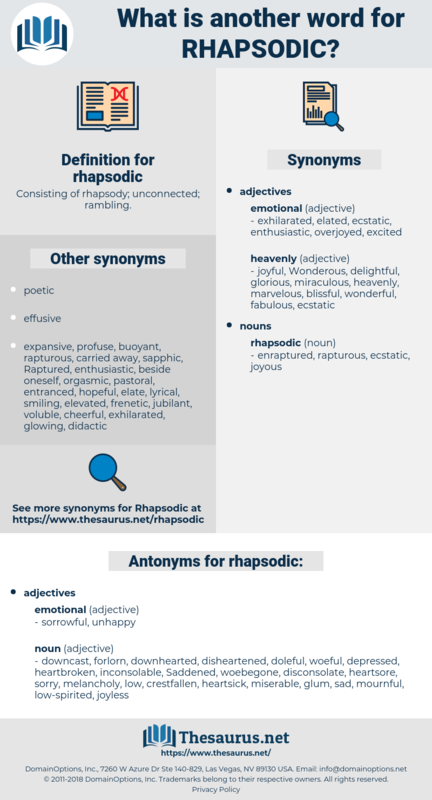 Consisting of rhapsody; unconnected; rambling. downcast, forlorn, downhearted, disheartened, doleful, woeful, depressed, heartbroken, inconsolable, Saddened, woebegone, disconsolate, heartsore, sorry, melancholy, low, crestfallen, heartsick, miserable, glum, sad, mournful, low-spirited, joyless, gloomy, dejected, brokenhearted, despondent, down, hangdog, wretched, blue. Anderson Crow, Marshal of Tinkletown, leaned upon his front - yard fence and listened to the rhapsodic comments of Miss Sue Becker on the passing panorama. rhapsodize, Rubus Cissoides, Rubus Idaeus, robustious, rhapsodise.